“Snee-Dronningen” (“The Snow Queen”) is one of the poems which most Danish composers have set to music, including several of the most prominent such as J.P.E. Hartmann, Niels W. Gade and Carl Nielsen. The dramatic poem “Højt ligger paa Marken” (“Lying high on the Field”) appeals to a musical interpretation, but should not be confused with Andersen’s fairy tale “The Snow Queen”. The four selected works accurately demonstrate the development from the folk ballad style of composition through the romantic song or ballad to the very simple folk song, which underwent a renaissance at the beginning of the twentieth century. The poem “Snee-Dronningen” (“The Snow Queen”) was first printed in the newspaper Kjøbenhavns-Posten on 17th March 1829. Andersen had had a poem printed in this newspaper before, “Det døende Barn”(“The Dying Child”) and about six months earlier he had completed his matriculation in Copenhagen after the turbulent school years in Slagelse and Elsinore. “The Snow Queen” is one of his early poems, published at a time when shortly before he had had his proper literary debut with his Fodreise fra Holmens Kanal til Østpynten af Amager i Aarene 1828 og 1829 (Journey on Foot from Holmen Canal to the East Spit of Amager in the Years 1828 and 1829), which soon became known in literary circles. In January 1830 “The Snow Queen” had already been included in Andersen’s first collection of poems, which was just called Digte (Poems). Later his good Swedish friend, the author Fredrika Bremer, singled out this poem as being particularly lyrical. In addition to the composers mentioned below, A.P. Berggreen also set the poem to music. The poem tells the story of the girl who is waiting for her miller-boy. However, he gets caught by the Snow Queen, who makes a bridal bed for him in the cold snow and ice. The girl gets frightened and goes to the mill – only to discover that the mill-wheel has stopped. Hartmann has set the text to music in a German version, “Die Schneekönigin”, which he composed in 1836 after travelling abroad, also in Germany. Andersen was one of those who welcomed his good friend Hartmann with special warmth on his return, and in his song of welcome Andersen prophesied “Such splendid things as you have seen and heard abroad, things that have pleased you and moved your heart, you will tell us about in your melodies”. However, there were no immediate traces of these travels in Hartmann’s music, and yet his journey still inspired him to compose music to Andersen’s “Snow Queen” in a German version. Hartmann arranged the poem strophically, but with each stanza’s variations and accompaniment clearly characterizing the dramatic text. In this ballad both the Snow Queen’s seductive temptations and her “Come, come!” are discernible together with the nimble dance of the snowflakes. The tragic discovery at the end can also clearly be heard in the music. However, it was not until 1840 that the poem appeared in Hartmann’s first collection of songs, Sechs Gesänge für eine Singstimme mit Begleitung des Pianoforte (Six songs for solo voice with piano accompaniment), op. 13, which was published in Leipzig. It mainly contained music set to texts by Goethe. At this time, however, Andersen was known in Germany and Hartmann therefore had no qualms about including one of his poems in a collection that was also aimed at the German market. Around the same time as Hartmann – probably in 1837 – Johan Christian Gebauer wrote his melody for “The Snow Queen”. At all events in December 1837 Andersen was able to write to his friend Henriette Hanck in Odense that “several of my poems have been set to music by Gebauer” Apart from “The Snow Queen”, this also applied to the poem “Rosenknoppen” (“The Rose Bud”), while the remaining songs had texts by H.P. Holst, Poul Martin Møller and Christian Winther. The songs were published in a collection of booklets entitled Sange med Pianoforte-Accompagnement (Songs with Pianoforte Accompaniment) in Copenhagen in 1837–38. Gebauer’s melody for the dramatic text of “The Snow Queen” is kept in a simple, entirely strophic form and is in the style of a folk ballad, where the mood is established by the minor key. The accompaniment provides the light dance of the snowflakes through the very quick movement of the introduction and the incessant sixteenths beneath the actual melody. The folk ballad style is typical of the romantic ideas of the period, when there was a great interest, not only in publishing the old folk ballads but also in writing new songs inspired by them. Niels W. Gade set three of Andersen’s poems to music in 1850. We cannot determine the specific occasion, but Gade was very productive at this time, during which he also completed his popular 4th symphony. After visiting Leipzig in the summer, he was appointed conductor of the Music Society in Copenhagen in the autumn of this same year – a post which he held until his death in 1890. At the same time he fell in love in 1850 with J.P.E. Hartmann’s daughter Sophie, with the result that they became engaged the following year. Andersen was one of the first to congratulate them. Gade’s arrangement of the poem is a very dramatic ballad that relates the unhappy love story with a melody and accompaniment that interprets the text. We sense clearly the miller boy’s happy jumps, the snow queen’s icy coldness and the snowflakes, and also the girl’s anxiety about her beloved. The songs for Andersen’s texts were published in the collection Tre Digte af H.C. Andersen for én Syngestemme med Pianoforte (Three Poems by Hans Christian Andersen for one Vocalist with Pianoforte) in Copenhagen in December 1851. Of these, “The Snow Queen” is the last. The three songs must have been popular, because in 1864 Horneman and Erslev were able to reprint them. Carl Nielsen composed Andersen’s text during the period 1914–17, and it was first printed in En snes danske viser, 2den Samling (A Score of Danish Verses, 2nd Collection) which was published in 1917 and contained two other songs with texts by Andersen. Nielsen published the collection together with Thomas Laub, who presented him with a series of poems (by Danish classical authors) for which there did not already exist particularly well-known melodies. The ideal was simplicity and closeness to the text, and in the foreword to the first collection there is a direct reference to the demand imposed by the Age of Enlightenment for folk melodies with ‘an air of the familiar’, which the well-known composer J.A.P. Schultz introduced in 1784. In his earlier songs, Carl Nielsen had mainly used poems by contemporary authors, so he tried in these collections to introduce a clearer and more sensitive tone with which to present the golden age poets of the nineteenth century. Carl Nielsen’s song is completely strophic and very simple in a broadly speaking three-note, broken accompaniment. “They have been kept so ‘einfach’ (simple) that a child can play and sing them; and they have neither a prelude nor a postlude” wrote Carl Nielsen about the songs in general. In this way the song has more the character of a ballad, which can also tell a dramatic story to the same melody over a number of verses (here seven stanzas). The composer kept at a certain distance from the subject and left it to a large extent to the performer to stress the drama in the action. This also applies to the experience the individual singer may have in a community song. The second collection of En snes danske viser was not so very well received, but in the long run became very popular [see title page here]. The collection clearly contributed to Nielsen’s being regarded, together with Laub, as a regenerator of the Danish popular song. “The Snow Queen” was first performed at a musical soirée on 13th April 1917 with the singers Emilie Ulrich, Carl Madsen and Anders Brems, accompanied by the pianist Salomon Levysohn. The songs in the collection were regarded, however, as community songs and this is also the way in which they became known. Ulrich v. Salpius’s “The Snow Queen” surrounded by figures from the fairy tale of the same name. 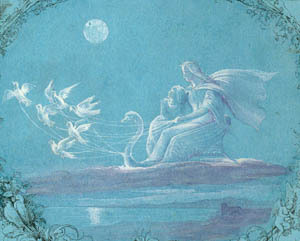 From Hans Christian Andersen’s Album (detail). 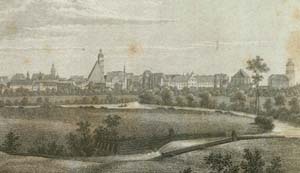 For a large part of the nineteenth century, Leipzig was one of Europe’s musical centres. Several Danes visited the city in order to study and during the period 1843–48 Niels W. Gade was active here as a composer, musician and not least conductor of the famous Gewandhausorchester. Gade had many of his works published in Leipzig, and Hartmann’s six songs, opus 13, were published here too – by Kistner, the well-known music publisher. Andersen also visited the city on numerous occasions. (section). 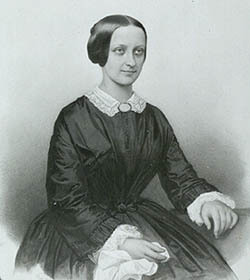 Niels W. Gade’s first wife, Sophie, was a daughter of the composer J.P.E. Hartmann. Andersen, who was a close friend of the family, had known Sophie since she was a little girl and partook, life and soul, in their delight at her engagement with Gade. Andersen believed that he had heard about it from Sophie almost before anybody else – and more or less at the same time as Gade wrote the three songs for his texts. 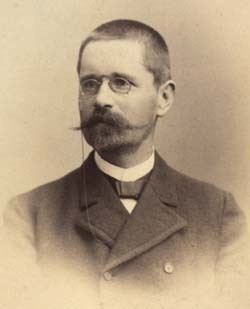 Thomas Laub (1852–1927) and Carl Nielsen were regarded as regenerators of the Danish popular song.